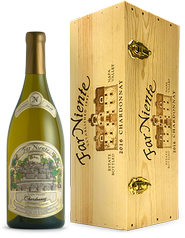 When it comes to late harvest wines in America, Dolce stands as the pinnacle: a honeyed wine, ripe with aromas of apricot and orange rind, capable of aging and evolving for years to come. 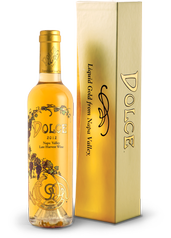 Dolce starts in the vineyard, when just the right elements – nature, craftsmanship and a little luck – come together to produce a wine that is truly a triumph over adversity. The double magnum (3L) bottle is sealed in hand-dipped wax and presented in a stunning, lacquered box. 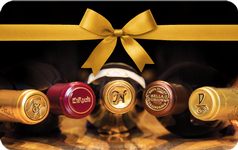 The 375ml bottle arrives in a gold-foil branded, custom gift box. 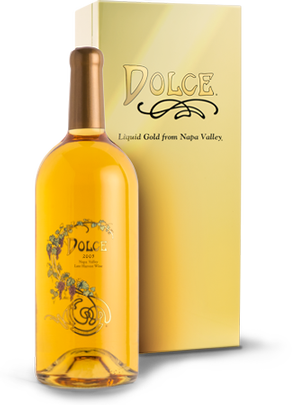 Dolce’s 20-acre vineyard is located in Coombsville, east of the city of Napa, and is situated at the base of the Vaca Mountains, which define the eastern border of the valley. The volcanic soil is loose and well drained, and the westfacing vineyard is protected from the prevailing winds so that the damp, morning fog of autumn—a very important factor in the development of Botrytis cinerea—hangs longer amongst the vines, often until midday. A combination of high humidity followed by drying conditions encourages, but does not guarantee, the growth of Botrytis. As the mold develops, its coverage is seemingly random with individual berries succumbing to Botrytis at different rates, if at all. Want your online gift card to land directly in your recipient’s inbox? Be sure to include his or her email address in the Shipping/Delivery address field.